I don't believe in God. Maybe I do. I don't know...but I'm not an agnostic. I just don't think existence works the way churches say, and I'll bet that if you could fire up a time machine and go tip some vino with Jesus, he wouldn't either. 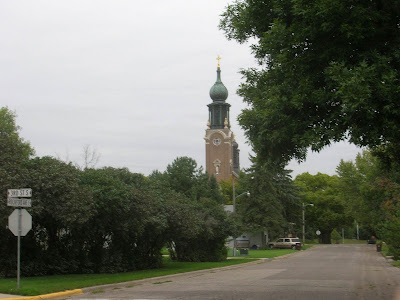 The think is: Eighty or ninety years ago something was meaningful enough to a congregation in Delano Minnesota, people poorer than ourselves, that they attached this folly to the church they built.